Available at Etching House, Alice in Wonderland hand signed fine art rag mat paper print, Alice in Wonderland is also available in a fine art Canvas print version of 106x120cm, also hand signed and comes with a certificate of authenticity. 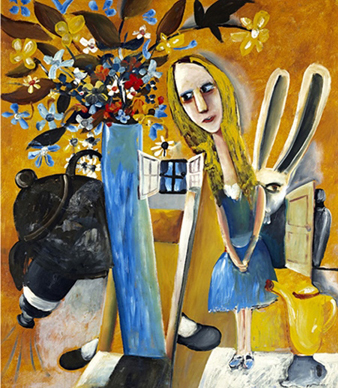 Alice in Wonderland is a hand signed limited edition Archival pigment print on artist paper, it is of the original painting by Charles Blackman form 1956, this limited edition fine art print has a image size of 84 x 66 cm with a sheet paper size of 95 x 77 cm . Lower left; please note the edition is limited to only 125. There is the embossed seal of the artist Charles Blackman in the lower left side. Etching House offers up to 12 months lay buy on this fine art print titled Alice in Wonderland. These Canvas prints are hand signed and come with a certificate of authenticity, also available in a gold plate frame.